A Grade Landscapes did a very professional job in an area that had very limited access; kept us up to date with what was happening and cleaned up after the job. Alex and his team did exactly as quoted. They were a friendly and professional group and I wouldn't hesitate to recommend them. Alex and all his staff did a really good job and they were very co-operative and good to work with. What a great group of guys! 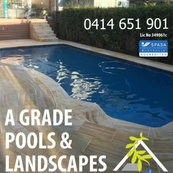 Alex is truly a pleasure to work with and will give you the best possible advice for your North Shore Landscaping needs.